It's DisneySMMoms Day...Plus a Blog Hop! Hi world! My name is Lin and I'm a Nutella addict. Seriously, I'm beginning to have a problem with Nutella! I had it when I was a kid, I'm sure of it. But, for some reason, Nutella hadn't found its way back into my life until the past few weeks. Actually, a friend's status update on Facebook sparked the obession. Since then, it's been a mainstay on the weekly grocery list. So far, I've had Nutella on toast, bagels, croissants, graham crackers, Wheat Thins (YUM! ), bananas, Nilla Wafers (little Nutella sandwiches...have I mentioned I have a problem? )...and, most recently, Nutella banana pudding. I've even filed away a recipe for Nutella shortbread. 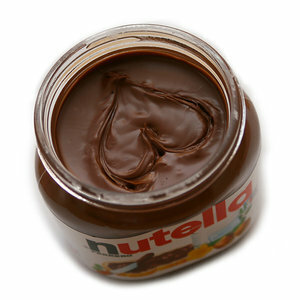 Actually, when I originally bought my first jar of Nutella in a few weeks ago, it was to make that Nutella shortbread. I'm on my third jar and it's been gone so fast each time that shortbread has yet to be made. The Hubby now loves the stuff, too, so that's not helping matters any!